Check Out the Free Webinars at RMSAAM! Soon, I am feeling soothed – as if the moment did call for a universal comforting session during that webinar. The video clip brings up Jenny. She has a sling-type contraption around her chest, and she rocks gently side-to-side; she jokes and says she’s not purposely making anyone sea-sick, but comforting her 1-month old baby, who appears to be very content! Soon, I am feeling soothed – as if the moment did call for a universal comforting session during that webinar. 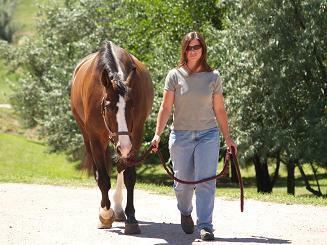 After all, maintaining optimum well-being, and care for the older horse is serious business. The webinar covered: Senior Equine Massage – Helping Support Quality Of Life For The Older Horse. Jenny navigated the waters smoothly as she covered several issues ranging from what makes a senior horse a ‘senior’? Certain signs and conditions of old age that include stiffness and sensitivity related to arthritis, and how massage can help address muscle atrophy, arthritis, poor coat, and emotional issues. Cushing’s disease was also covered in great detail, and Jenny never skipped a beat! So who is Jenny Rukavina-Marchese? 2007 was a year of big changes for Jenny, when she found herself transplanted to Colorado from Montana on a new and different career path. Formerly a high school biology teacher, she now finds herself immersed in the horse business after founding Acadia Equine Rehabilitation just south of Denver. AER was an idea based on Jenny’s personal experience bringing her mare, Acadia, back to work as a dressage horse after sustaining a severe stifle injury that required surgery and months of layup and rehabilitation. Becoming a certified equine and canine massage practitioner fit into the mission of her business, and until recently she said one of the only things missing in her life was teaching… so she now balances her time between her equine rehab clients, teaching equine and canine massage classes for the RMSAAM, as well as a limited number of equine and canine massage clients. Jenny shares her life with Australian Shepherd Cori, a faithful co-worker and companion; warmblood mare Acadia (aka “Cadie”), inspiration for many things and dressage partner; and African Grey Parrot, Roscoe who tries to keep her in line. In her spare time she can be found hiking and birding with Cori, watering her over population of orchids, and continuing her education. You can tell Jenny has extensive experience teaching, and understands the art of knowledge unfolding. She was straightforward, answered questions asked by other participants with patience, kindness, and compassion, and managed to sail through the webinar without making anyone sea-sick! She was engaging, and very knowledgeable. Oh, and we can’t forget her great sense of humor! Folks, don’t miss out on these free webinars! They’re informative, engaging, interesting, and oh, did I mention FREE? Click here to visit the webinar calendar, and you can also register for them on the same page. See you there! It’s not often I get to sit in on a classroom session. So, when I had the chance to do so for the first Equine Massage class this year of 2012, I was thrilled; but more importantly, I was a student for a few hours. The four students who attended the class, all had impressive backgrounds and experiences with horses. I, on the other hand have a dangling, distant, memory of riding a horse at the age of 12, and was incredibly sore after, and decided it would be a VERY long time before I rode one again! The class started with a gentle and engaging conversation between all the students and the instructor, Linda Aaron. They all exchanged a bit of information as to why they are interested in becoming Equine Massage Practitioners, and shared their love for horses. Though it’s not unusual for a student to have little or no experience with horses, the curriculum is designed to fit and work around the non-experienced student. As I sat and listened to Linda, her words marinated, and gelled, and I came to understand in just a few hours, why massage is so important for horses. Linda discussed the basic outline of the course, and led us along a step-by-step process that seemed to be delivered at a comfortable pace, despite the full and comprehensive course material. It was understood that learning Anatomy for example, might seem a bit intimidating, but what I found helpful, was that the students got to work out the names, and what each muscle does, by writing out the definitions, and then physically labeling the horse’s muscles accordingly. Just when things were starting to get really interesting, I had to take my leave, but ultimately ended up taking away with me a solid understanding of what goes on at RMSAAM’s Equine Massage Program. I am looking forward to attending the segment of the class, where the student performs an actual Massage sequence! Stay tuned! … And I may surprise myself one day and get back on a horse again!